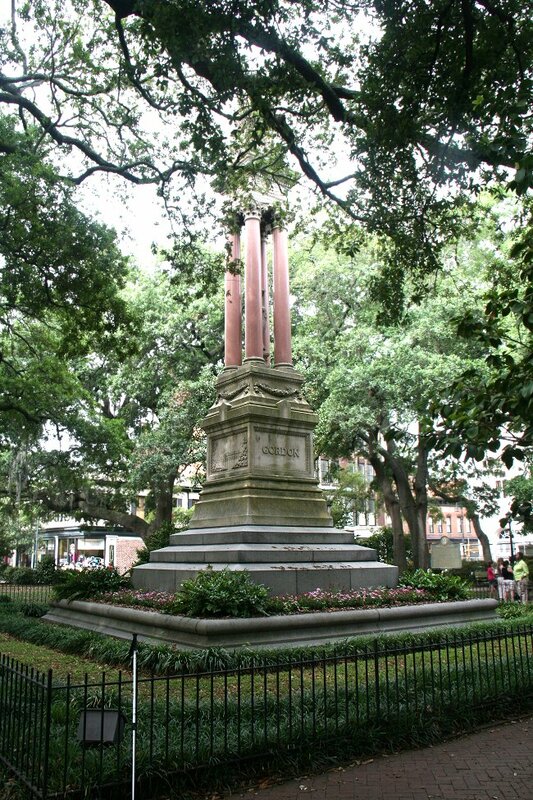 A unique feature of Savannah is that its founder, British General James Oglethorpe, laid it out with streets on a grid, along with periodically-spaced squares or parks, also on a grid. 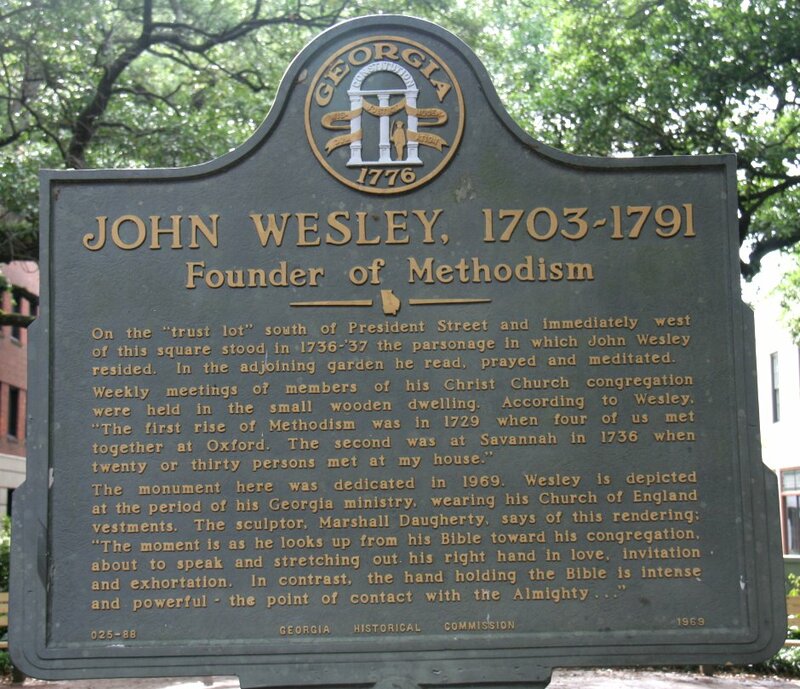 He devised this plan while in England, long before he headed for the new land. 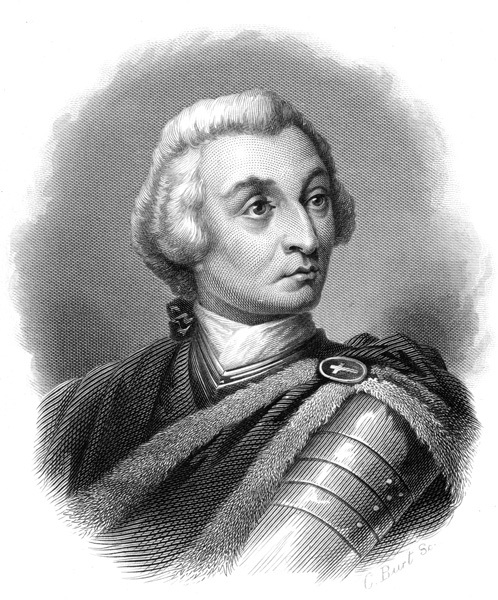 Oglethorpe founded the colony of Georgia in 1733 and was its first governor. Our objective on our second day was to walk through a few of these squares, from one to the next to enjoy their beauty and see what was in them. The image below is of the map I carried folded in my shirt pocket during our five days in Savannah, and it's a bit worse for wear. 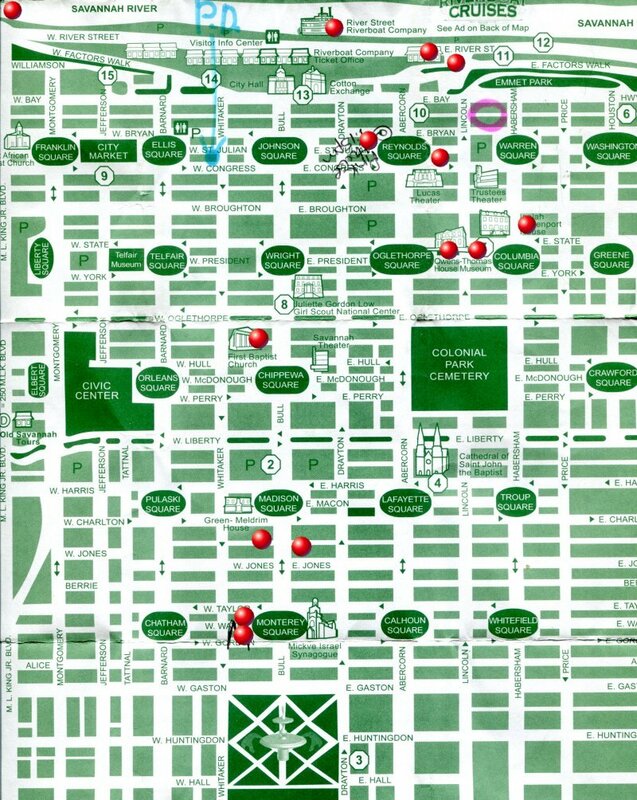 But it's the best map of the historic district and squares I've seen. It was given to me from a huge glued block of them at our hotel. The concierge indicated the hotel (Staybridge Suites) by the pink circle in the upper right corner of the map. Click here to open a copy in a separate tab for handy reference as you view the photos and location captions that follow. Many of the squares and interesting sites in the map below are "hot spots" which you can click on to jump to photos and information about that site. You can determine which are active by scanning your cursor over them. If the arrow turns into a hand the spot is active. Also, to help in knowing the sites you will jump to, text will open when you are over the spot. Finally, many sites were not noted, or were noted inaccurately, in the printed map so I've added red balls to help you find the hot spots and more accurately note the sight location. If you tour the pictures via the hot spots, make sure you close the separate copy of the map and all the other pages in this series before you use the hot spots, and close pages that open after you've seen what you want. There are typically several photos about each site, so after you pop out to them make sure you scroll up and down to find all the pertinent photos. 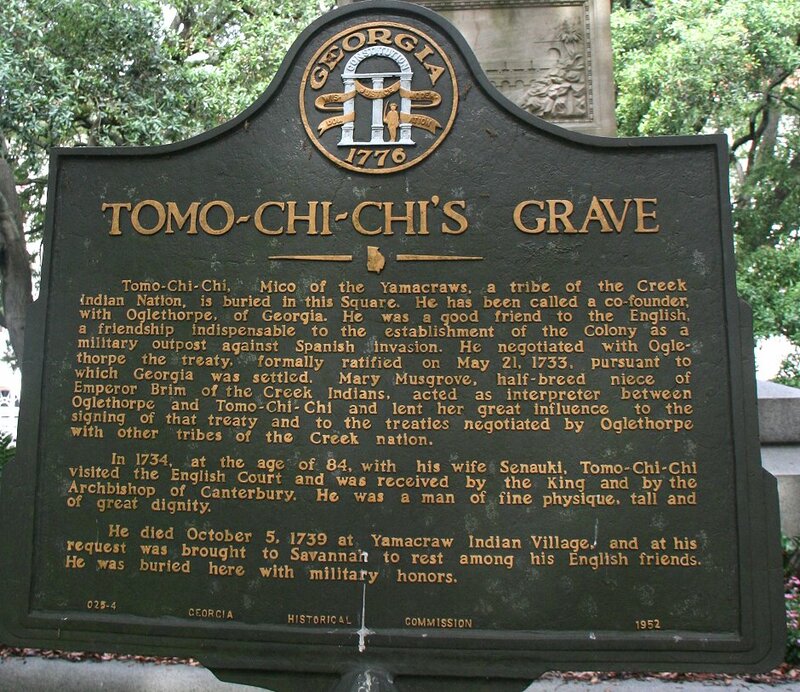 After you've popped out to a few sites to get a feel for Savannah, I suggest you then scroll down each web page in sequence to see the pictures, read the text, and follow reference links that interest you as the story unfolds. The hot spot map below is intended to help you find specific photos and information. You can come back to this page for this access after you digest the material in the six-page series. 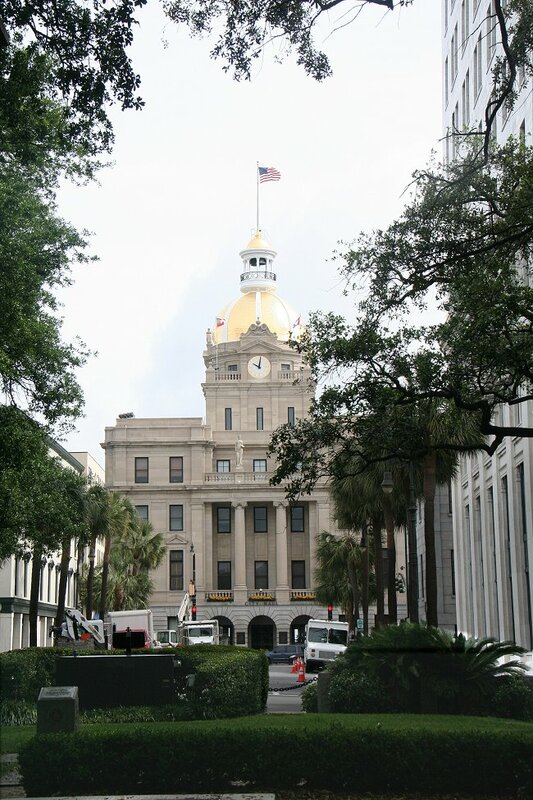 After a hearty breakfast of scrambled eggs, bacon, coffee cake, hash browns, fruit, orange juice and plenty of coffee (included in our hotel rate) we began our walk by heading down Lincoln towards Reynolds Square. 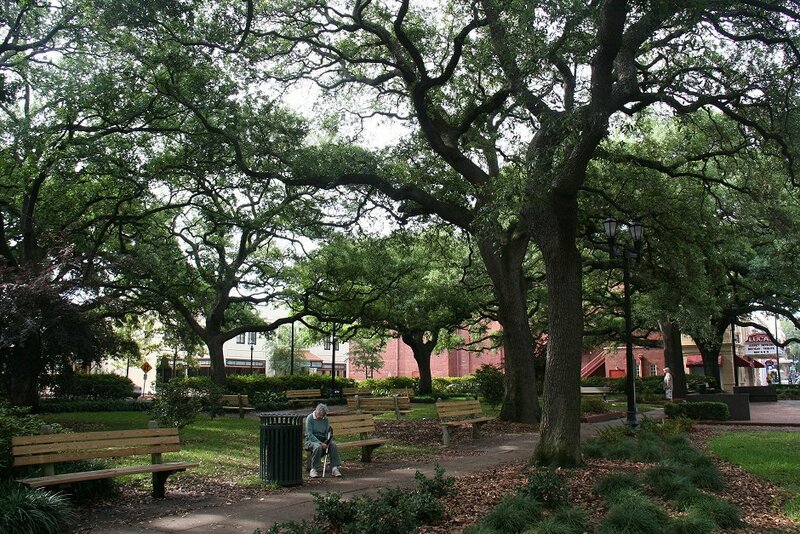 Mary sits glumly in Reynolds Square. She caught the cold I had since two days before we left home. By this time I was mostly over mine but knew it was bad. 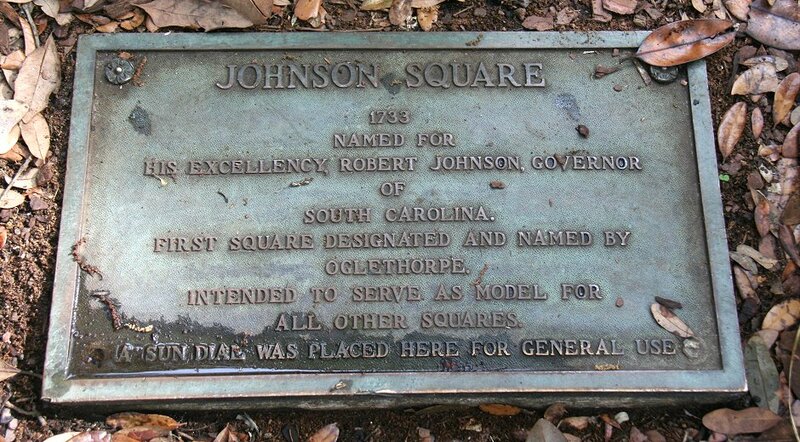 The squares are welcoming and shaded by huge live oaks. 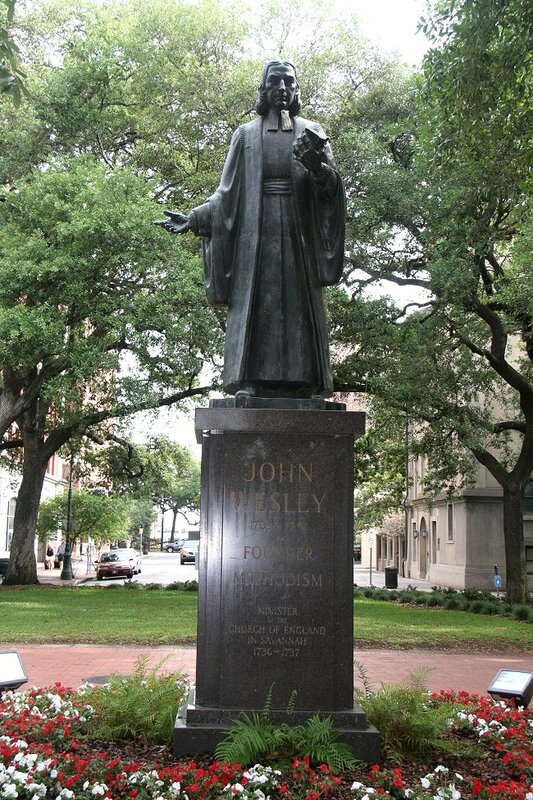 Reynolds Square features this plaque and a statue of John Wesley. 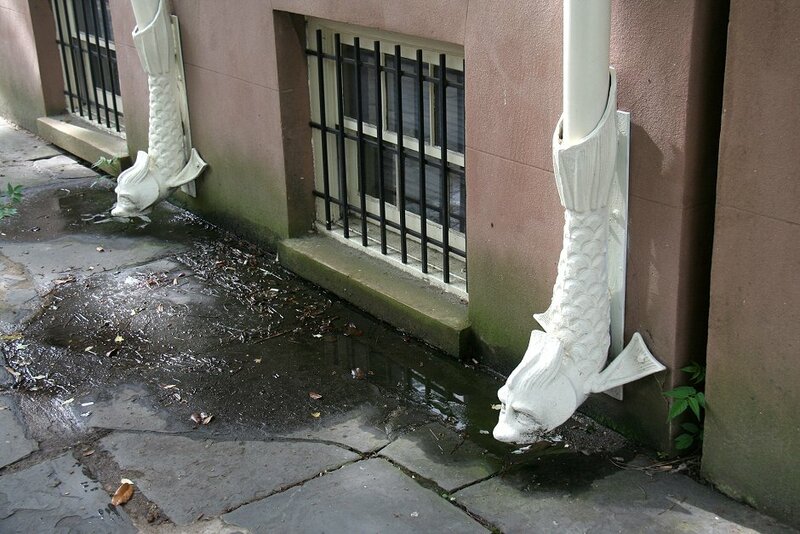 We passed these interesting downspouts as we continued toward Johnson Square. It had rained. A reminder to me of where we were. 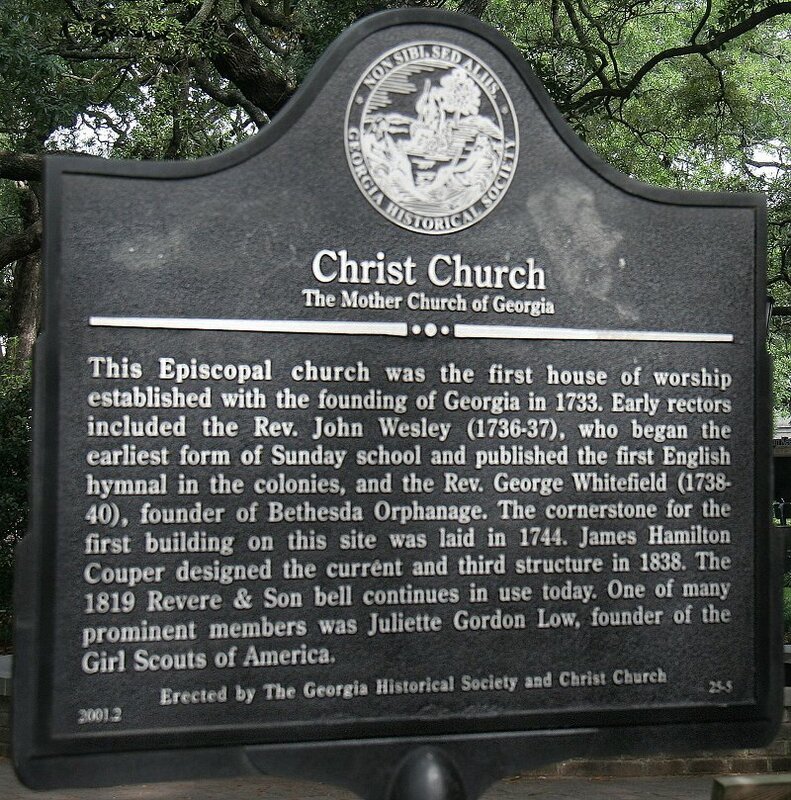 Johnson Square is surrounded by massive bank buildings, and Christ Church. Christ Church, 28 Bull St, as the sky cleared. But I still had to brighten the buildings in this photo quite a bit. 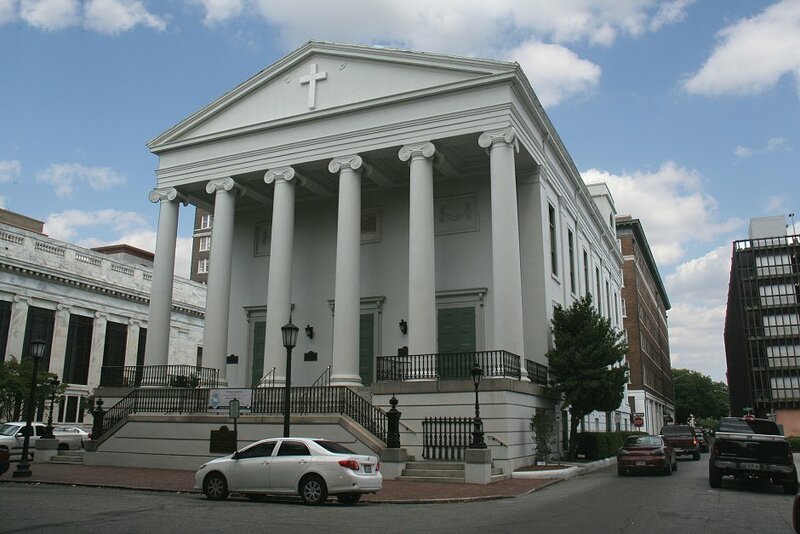 The entry stairs originally extended the full width of the building and down to street level, appropriate to Greek Revival style. 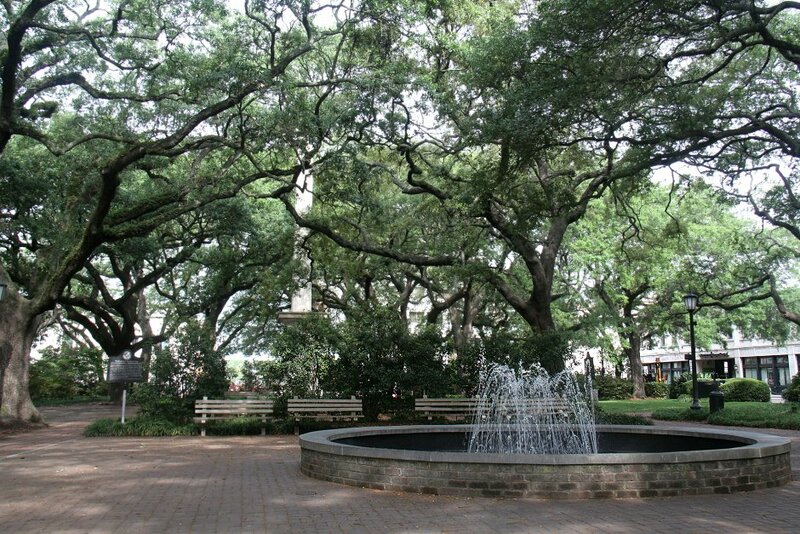 Nice relaxing (and cooling in hot weather) fountain in Johnson Square. 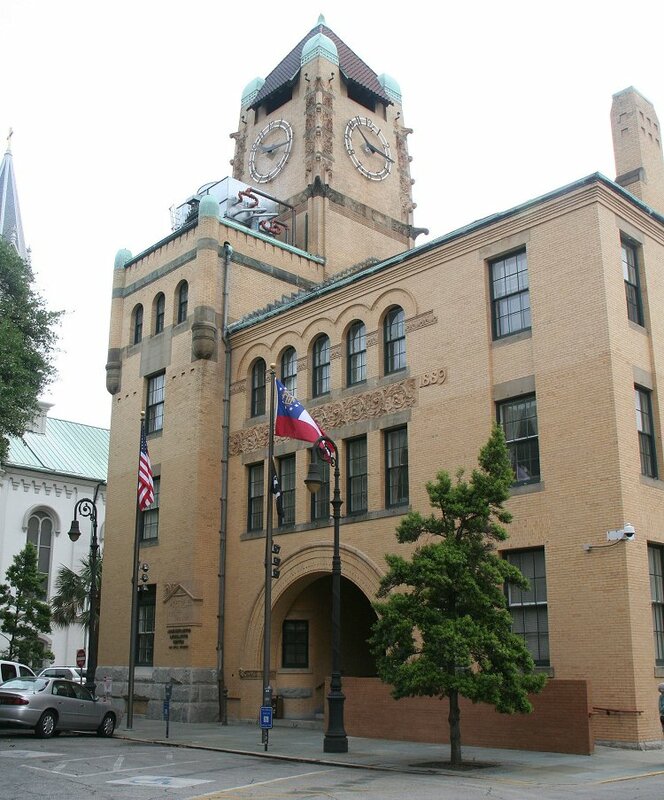 City Hall, viewed up Bull Street from Johnson Square. 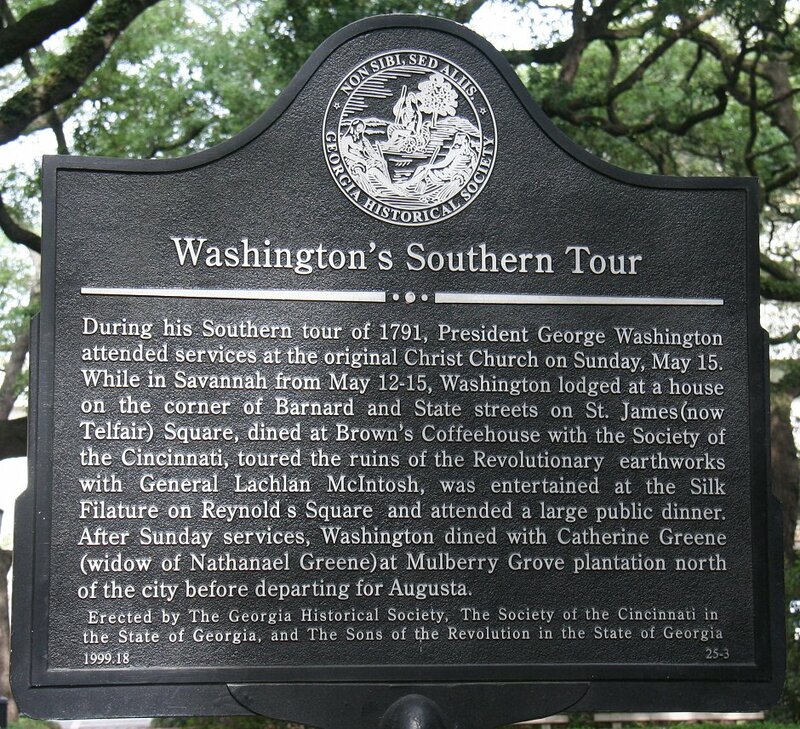 Plaque next to the Gordon monument in Wright Square. House, and passed the Old Chatham County Courthouse, 124 Bull Street, on the way. 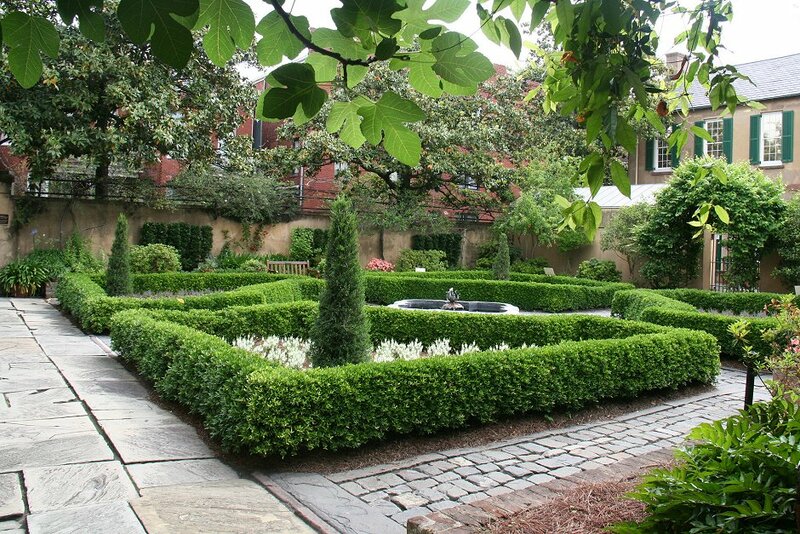 This is probably the most toured house in Savannah. 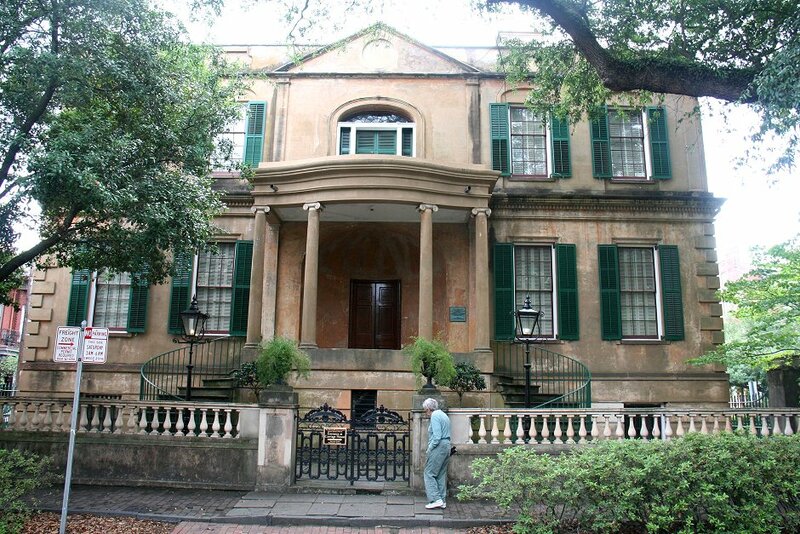 Side porch of the Owens-Thomas House, 124 Abercorn Street, designed by William Jay, his first. 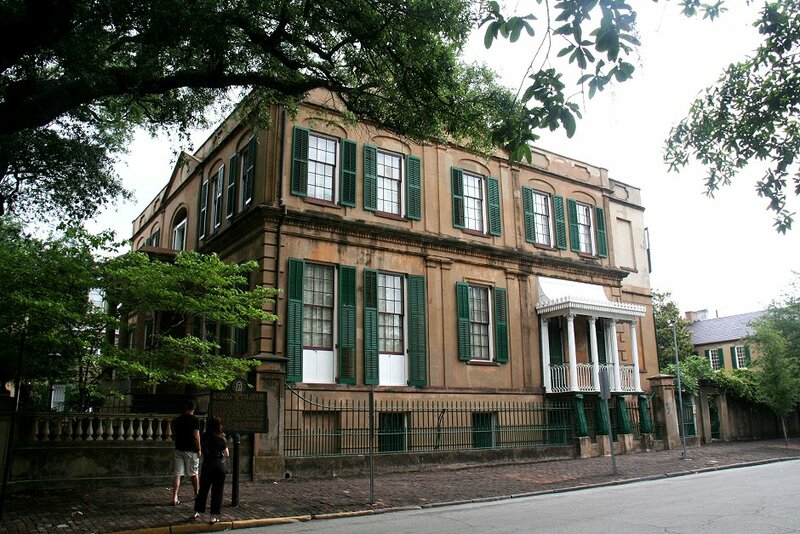 This house is considered by architectural historians to be one of the finest examples of English Regency architecture in America. The porch is cast iron, a product that was sold by the owner. 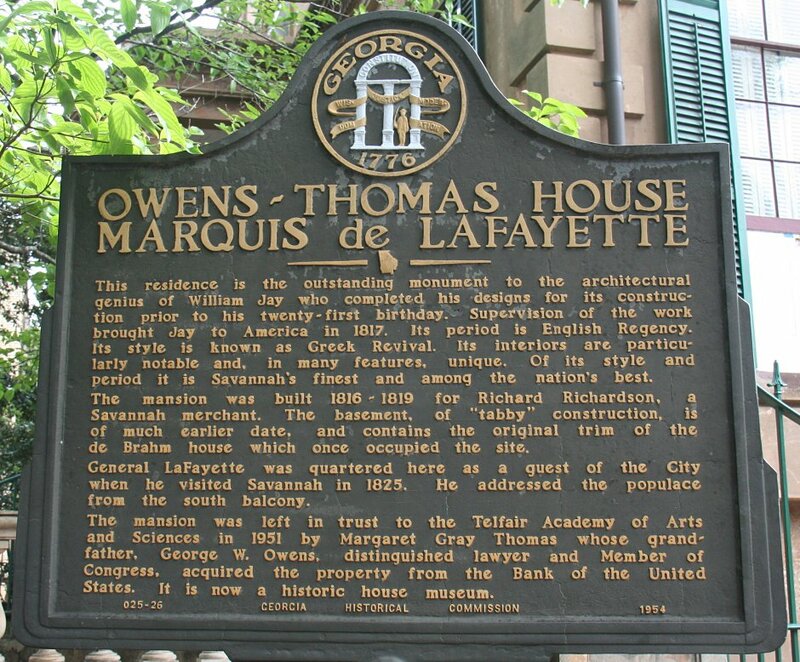 Main entry of the Owens-Thomas House. Courtyard between the house and servant/carriage house on right (taken by sticking my camera between the rungs of a fence). 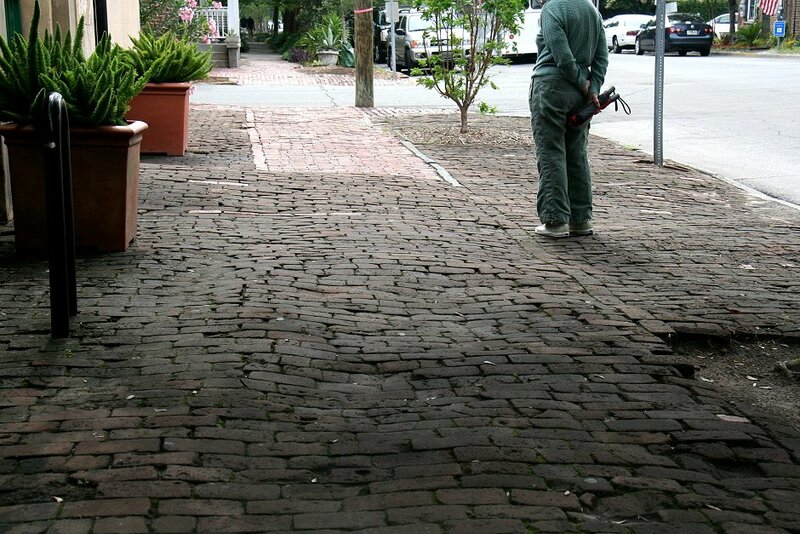 Warped, brick sidewalk along the Owens-Thomas House and servant/carriage house. We didn't tour the house on this walk because it wasn't open on Sunday.